Grove-Gas Sensor (O₂) is a kind of sensor to test the oxygen concentration in air, which is based on the principle of the electrochemical cell to the original work. You can know clearly the current oxygen concentration when you output voltage values proportional to the concentration of oxygen and refer to the oxygen concentration linear characteristic graph. It's very suitable for detecting oxygen concentration in the environment protection. 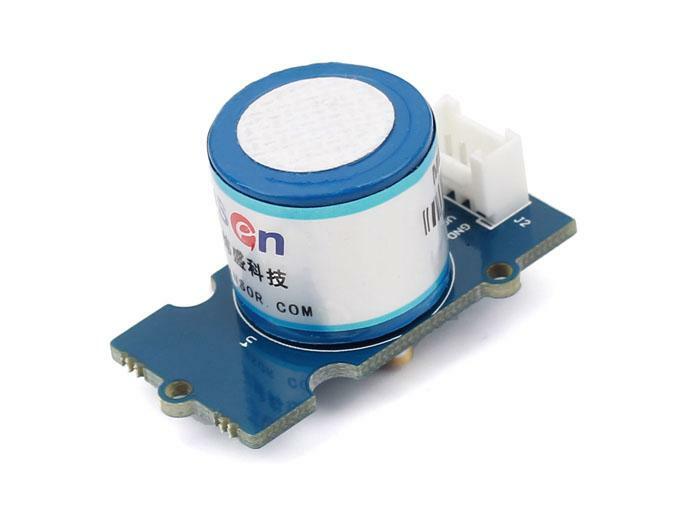 Grove - Gas Sensor(O₂) is an organic reaction module, it can provide a little current while putting it in the air, we don't need to provide an external power to it, and output voltage will change as time current changes. Note that The sensor value only reflects the approximated trend of gas concentration in a permissible error range, it DOES NOT represent the exact gas concentration. The detection of certain components in the air usually requires a more precise and costly instrument, which cannot be done with a single gas sensor. If your project is aimed at obtaining the gas concentration at a very precise level, then we do not recommend this gas sensor. Notice: Please power the Gas Sensor(O2) for more than 48 hrs (warm up time) before reading data for actual calculation. 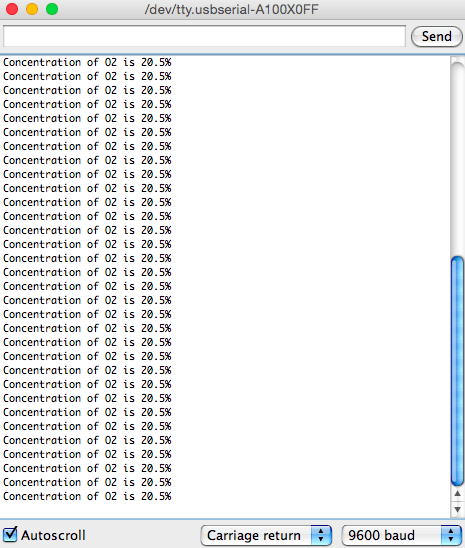 Here is an example of O2 concentration controlled Buzzer. When Oxygen concentration gets lower than the minimum safe concentration, the Buzzer will ring. 1. Connect the module to the Analog port 0 of Grove - Basic Shield using the 4-pin grove cable. Connect Buzzer to Pin 3. 2. Plug the Grove - Basic Shield into Arduino. And connect Arduino to PC by using a USB cable. 3. Copy and paste the code below to a new Arduino sketch. Please read this if you do not know how to upload. 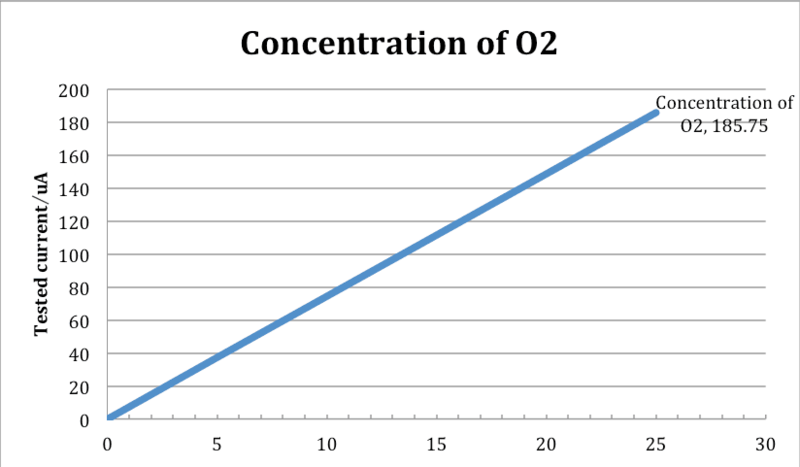 is interpolated to get the O2 Concentration in percentage. 4. When the sensor is in room air, the buzzer will be silent. Blow the sensor. At this time, if Oxygen concentration is lower than set threshold, the Buzzer will ring. You can check the output voltage (amplify 201) after opening the Serial Monitor. We tested it inside office, so the concentration of O2 is about 20.5%. Notice: We have adjusted the figure in a clear air. We have updated it in the program, please refer to the program instead of datasheet.